False goat's beard (Astilbe spp. ): growing, planting, caring. Large perennials for the shade. Scientific name : Astilbe spp. 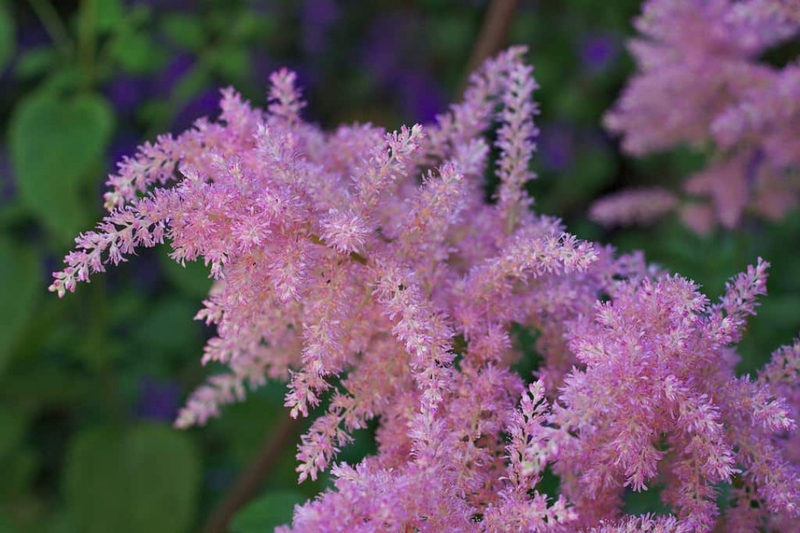 Astilbe is a genus of 18 species of rhizomatous flowering plants within the family Saxifragaceae, native to Asia and North America and cultivated by gardeners for their large fern-like foliage and dense flowering. They are hardy herbaceous perennials widely adapted to shade and water-logged conditions, hence particularly used as pond-side planting. Numerous hybrid cultivars have been raised. The best planting period is March to April, or between September and November. Plant your astilbe in a semi shade or a shady situation in neutral to acid soil, preferably heavy and moist - for once ... Prepare the soil by a digging (without necessarily upturning it, with a fork or a grelinette), scratching and raking. Plant with 0.5 to 1 m between plants according to the species and the variety. Tamp the soil well to avoid air around the roots, then water thoroughly. Astilbes like humus so a small addition of fibrous compost on the top of the soil will be beneficial. Planting in pots is possible in a large container placed in the shade, filled with moorland. During the first month, water once or twice a week. In case of drought, watch especially your astilbes, they prefer the humidity. Water adult plants by big inputs even if you do it less often; the plant will develop a better root system if it has to fetch its water in depth. When watering, wait until the water that you pour stops rushing into the ground, and forms a small puddle. Do not wet the foliage, especially in the evening because it will be all the more attractive for molluscs. Your false goat's beard will widen for several years, so during this interval you will have to weed occasionally to limit the competition. If you have mulched, weeding should not be too frequent. Astilbes are multiplied by tuft division in March. A spade in the middle, a new hole, and voila ... A few handfuls of compost and a watering can later, you have a new plant.